Chronicling America: Historic American Newspapers. Library of Congress. McDonough, of Nelson county, Kentucky. 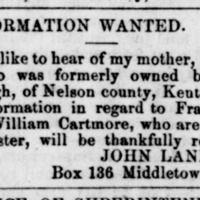 “John Lane, Middletown, CT, searching for mother, brother, and sister,” Information Wanted Ad, New National Era (Washington, DC), October 12, 1871, Last Seen: Finding Family After Slavery, accessed April 19, 2019, http://informationwanted.org/items/show/1782.